Upon the sale of my last service oriented business, I purchased and read a book called The Four Hour Work Week. It became very clear to me to have a 4hr work week I would need a product and not a service. I still provide services, but I have decided to structure them differently. Service oriented businesses are tough. There is a lot of overhead involved in a service oriented business. People get emotional, and keeping them happy is tough. At my last company, we had billed out around 37,000 invoices. Happy customers included Kim “the cookie lady” who would bring us cookies, and Rashid, our guy who ran the neighboring Subway shop who would come in daily to say hi. We had a cigar guy, a beer guy, and a pizza lady. We had some very happy customers that we always went the extra mile for. You have to really provide a legit service to stay popular. 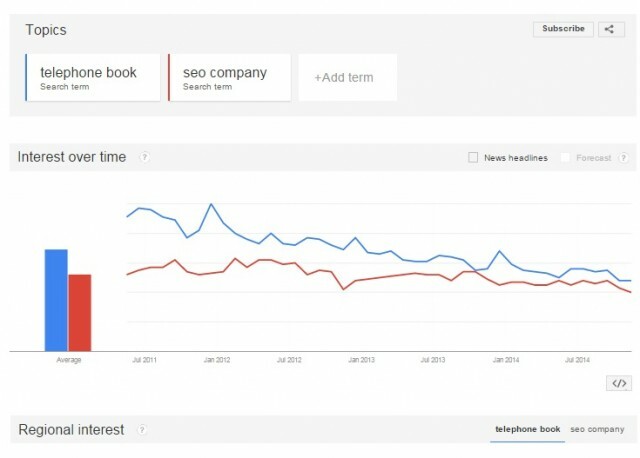 What happened to SEO companies? Not all SEO companies are bad, but unfortunately, SEO has become a 4 letter word. Many SEO companies employ a churn and burn tactic; they are used to losing customers every so often but new customers are ready to take their place. What will happen when the flow of new customers slows? Many are destined for failure simply due to the way they are structured. I almost went down the salesperson path when I opened Telapost. Fortunately, I did not. I had interviewed several seasoned salespeople who worked with several firms. We now operate via word of mouth here. Demand for what we do is extremely high, and in 2014 I decided that we simply do not have a need for a salesperson. SEO companies that have sales staff, managers, and a plethora of other expenses often provide very little to their clients in exchange for their advertising dollars. Weeding out the good from the bad is difficult. The good companies will have a small army of extremely happy clients ready to vouch for them. Telephone books were disrupted by the Internet. SEO companies made their own reputation. Some people are still looking for both, but this is trending down as seen on this screenshot from Google Trends taken Nov 22, 2014. I suspect the decline will continue into 2015. In 2015, I predict companies will continue to advertise online. Being found in search is huge for businesses. People are going to want real results and work though. Companies selling spam, press releases, and low quality content are going to be in trouble. The best sale is ranking in search. The businesses looking for your help are looking to rank it search. It makes sense that they would call and trust a business they found at the top of Google search. When employing a sales team, you are sending out men and women. They have to sell a product or service without the potential customer seeing the value. Some sales people are VERY good at explaining the value but good business men and women are always reluctant to accept something that is “told to them”. They would rather figure it out themselves. In 2015, many of the large SEO agencies and firms are going to struggle because they do not practice what they preach. They claim they are going to do “content marketing” and “content creation” yet they have one blog post in the last 60 days on their website. Heck, most of them only rank for one or two keyword phrases. I have no idea what is going to happen with the Google algorithm but I know my clients will be just fine because original content is being published to their websites on a consistent basis. Any SEO company that is offering the ability to “rank in search” without any content is treading on thin ice. I see no way that companies can simply do magic tricks to get clients to rank. In the near future they are going to figure this out and they are going to have to change their entire business model. Some will be fine but others will die because the word will get around that they ruined a large number of websites. It will be interesting to see how the year plays out. Good point, ranking for 1 or 2 keywords is nice for SEO companies and all but is so useless to the average company. You should write a post about that! Now that I think about it, most good SEO companies have no sales staff whatsoever. If a company is great at creating inbound leads and content marketing, why exactly would they need a sales staff? This just gave me a fantastic idea. Thanks for commenting! Well so finally I learned a right thing here, actually someone told me about this Search Engine Optimization and I was too blank after hearing the term and I asked to people but could not get a definition and now I understand the meaning.